I am still a big believer in the high-low skirt and dress trend. It is one of my all-time favorite cuts for clothes because I love how whimsical and airy the style is. 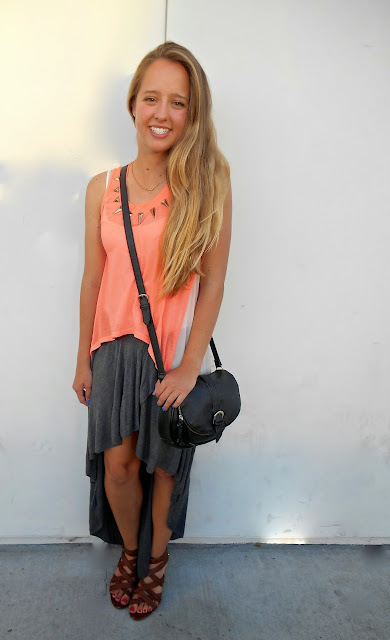 I also think that this is one of the few times that this skirt has actually made an appearance on my blog. When I realized that I became quite surprised, considering that I wear it all the time. I am officially on summer vacation, and boy am I tired. I don't officially travel home until Sunday, but it feels wonderful to not have any school work to worry about. I feel like I need to sleep for a whole month in order to recover after my finals. I wrote over 20 pages worth of essay writing in a matter of three days. Needless to say, my brain is fried. Thanks for stopping by! And have a lovely weekend!